Terracotta vase by Clodion. The body is decorated with a frieze depicting eight human children, two winged children and two satyr children at play. The stylized handles are in the form of chimerical horned creatures, with human and animal features, connected by berried laurel swags. The vase is nearly identical to the first of a pair of terra cotta vases in the Hermitage, which was exhibited in the Clodion exhibition in the Louvre (March 17- June 29, 1992). Boucher owned a seemingly identical vase and may have collaborated with Clodion in its design. He used it in several paintings and drawings. Versions of this model (probably either this vase or the Hermitage version) were noted in some of the most important French sculpture collections in the eighteenth century. Literature: The Art Institute of Chicago: Museum Studies. Vol. 15, No.2, 1989. 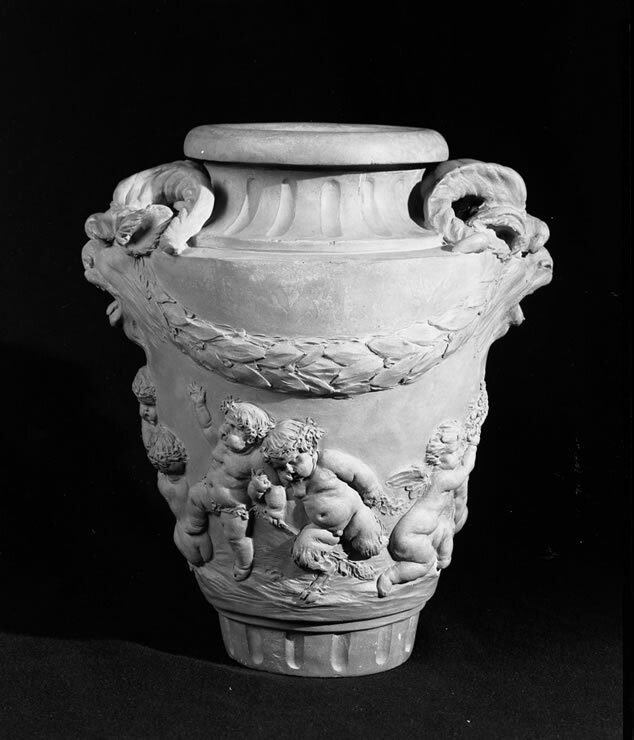 Anne L. Poulet: “A Neoclassical Vase by Clodion”. Page 143. Illustrated fig. 4. Anne L. Poulet and Guilhem Scherf: Clodion; Réunion des Musées Nationaux, Paris, 1992. Pages 77-86. This vase is mentioned on page 80.